Traveling changes you. This is my new self portrait. As you can see I am looking more French wearing more eyeliner and my lips are puckered saying "Oui" instead of "Yes". I am getting a little pale due to the lack of sun and I am a little sad because I'll be leaving Montreal soon. Montreal has changed me. I'll compare it to working on a house. We all assume that when you finish a major construction project, the house will be changed for the better. We forget that you will change also. Your muscle tone will be different, maybe you have become proficient with a new tool and you often increase your mental acuity. You find that you should have taken a before-and-after picture of yourself not just photos of the house project! 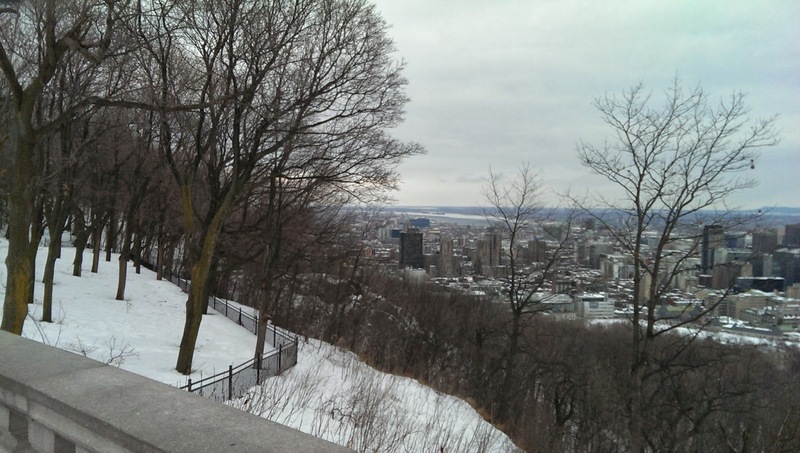 With just a month in Montreal, I wasn't expecting anything in me to change. But I have changed. Muscle wise, I am just stronger and certainly more confident of my balance. 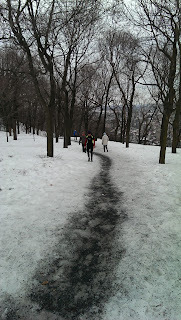 Walking on ice and snow and hiking up and down hills along with yoga have made hip pain vanish. 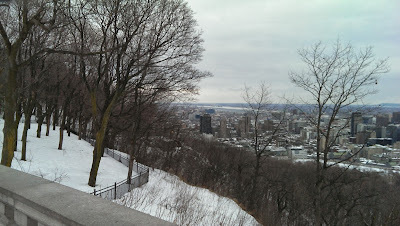 These photos were taken on the day that I likely walked seven miles including this wonderful hike up, across and down Mont Royal with Diane, my Women Welcome Women friend. I started somewhere near those buildings earlier in the day. A stunning exhibit of photos by a Montreal female journalist has made me feel more comfortable taking photos of people. I think my eye has changed. Today Kara asked me to take photos for her yoga blog. Here is one of my favorites. I'm more certain that I could learn a new language. Little by little I recognize more words and have more courage to order in French when I can. 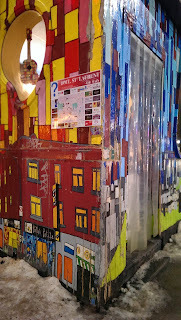 Samantha took me to a little tiny, very colorful corner restaurant to try poutin. 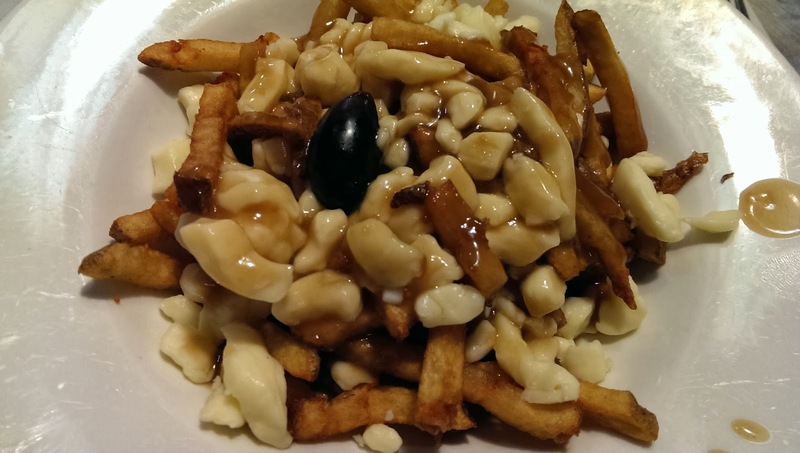 This is a famous French Canadian meal of french fries, gravy and cheddar cheese curds. 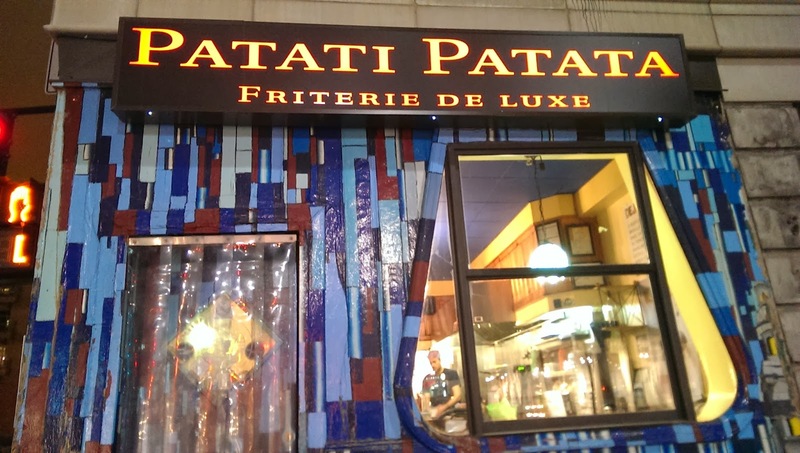 Patati Patata double fries the fries and uses fresh organic cheddar curds. $5! So tiny, seats only a dozen people! Curiosity pays off. I am ever conscious of the brevity of my time here. Having spotted an interesting building on the side of Mont Royal, I made a note to find a way up to see it closer. 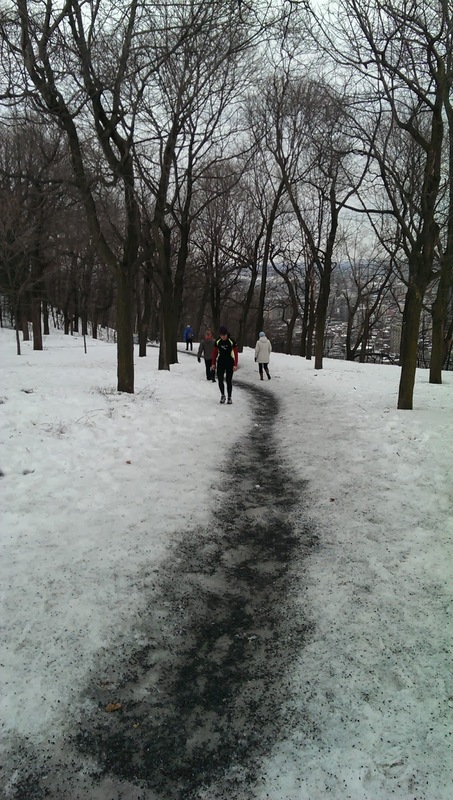 Diane indulged me after just having walked miles and miles up and over Mont Royal. 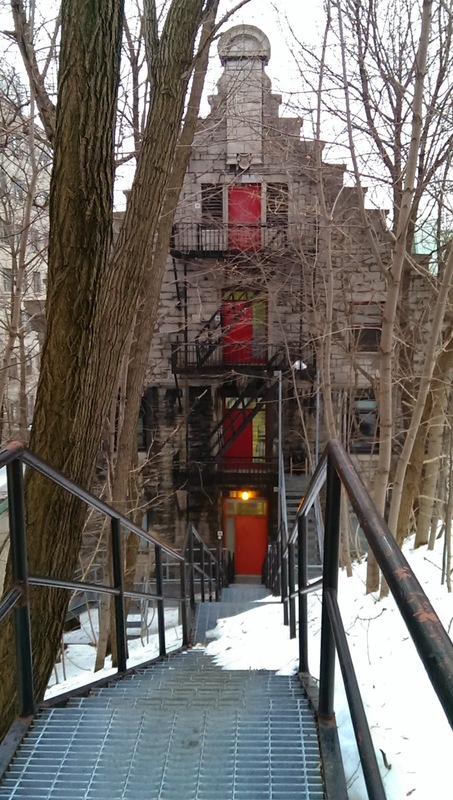 We headed back up the hill on a narrow road and had the good fortune of finding this colorful back side of an otherwise nondescript stone building. It is a medical facility of some sort. My eye seems more willing to look for the unexpected. 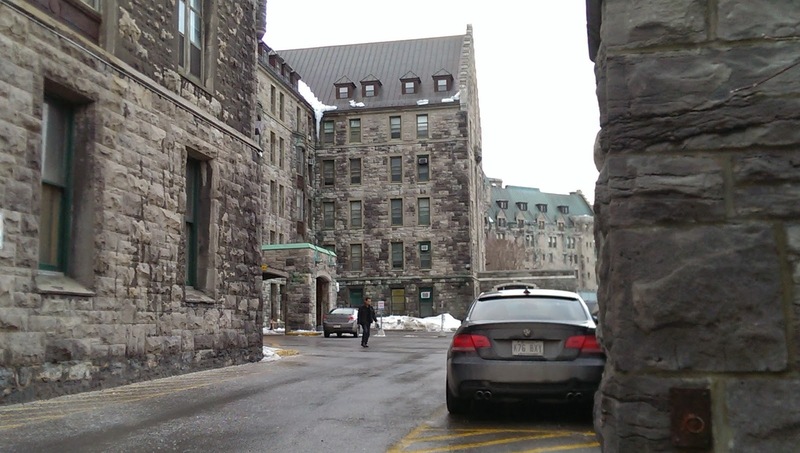 Turning my back on this building and walking a few steps was like walking into some medieval place, if only one could ignore the cars. 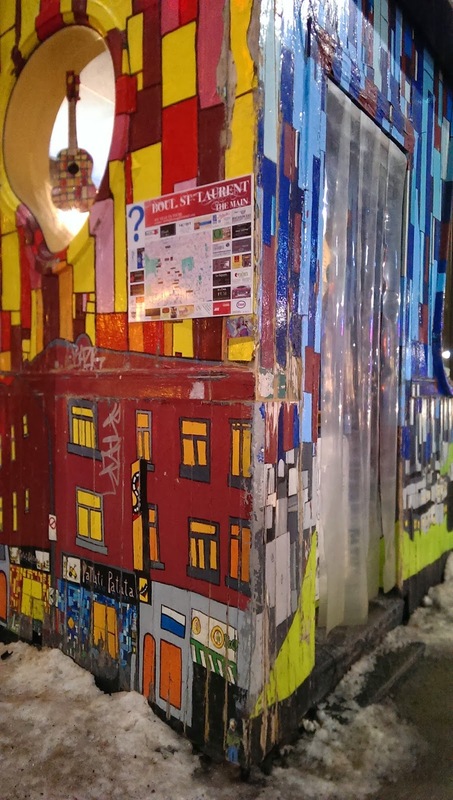 I have lived in a number of big cities, but Montreal is really quite special. Two Metros and one bus away and one can get to the rapids on the Saint Laurence River. 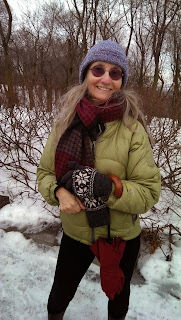 We walked the length of the rapids on a narrow spit of land bounded by ponds of a wildlife sanctuary. These rapids caused problems for trade further inland until a canal was built and the railroad arrived. 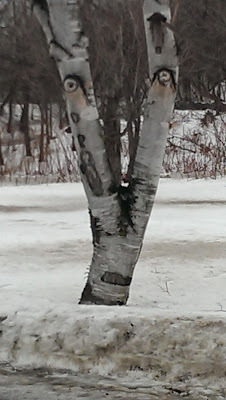 I was surprised to see evidence of beaver, one of the staples of the fur trade of the 1600's and 1700's. 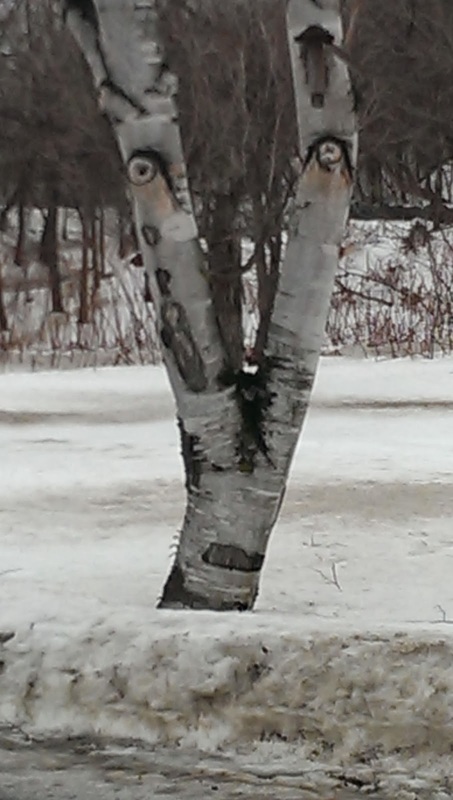 I am sure they were likely hunted to almost extinction. The rapids were moving at a frightening speed. Along the path were metal plaques with quotes by early explorers. Their names were previously associated in my head with history books, not any more. My love of history is returning.